Please note: Visit the Registration Desk as soon as you arrive at the Warwickshire Event Centre in order to receive your Visitor Pass. Please note: There is access to the outdoor exhibition areas earlier than this, please get in touch for more information. Your Exhibitor Badges will be either waiting for you on your stand, or available from the Registration Desk. From the South via M1: Leave the M1 at Exit 17 (M45). Follow the M45 to its end, then at the roundabout, follow the A45 (straight on). At the next junction (1 mile) turn left onto the B4453 signed Princethorpe. Follow this road for 3.3 miles until you come to the junction with the A423 Coventry-Banbury Road. At this junction go straight across on to the B4455 Fosse Way. Follow the B4455 for 5.1 miles passing through three crossroads to arrive at the exhibition centre. From the North via M1: Leave the M1 at Exit 21 and take the M69/A46 right to its junction with the A45 and at this roundabout turn to the left taking the A45 signed London. After a few hundred yards take the slip road on the left marked A423 Banbury. Follow the A423 going straight across two roundabouts for approximately 3.7 miles to Princethorpe. At Princethorpe, turn right onto the B4455 Fosse Way for 5.1 miles passing through three crossroads to arrive at the exhibition centre. 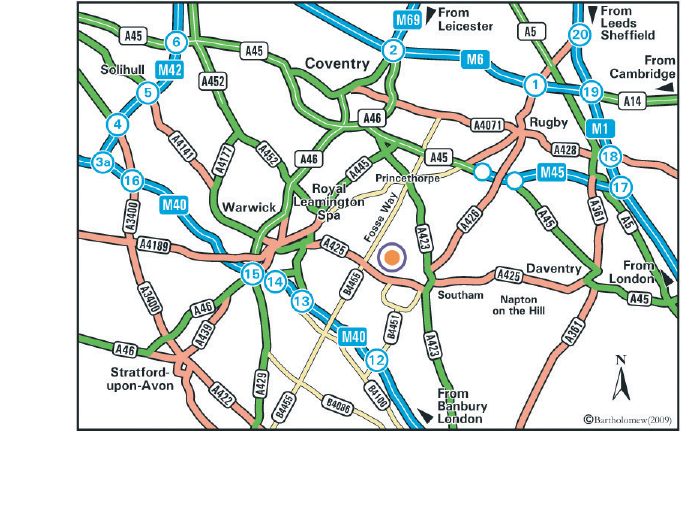 From the North via M6: Leave the M6 at Exit 2 following Coventry signs, then at roundabout take the A46 signed Coventry (E&S) and Airport to its junction with the A45. At this roundabout turn to the left taking the A45 signed London. After a few hundred yards take the slip road on the left marked A423 Banbury. Follow the A423 going straight across two roundabouts for approximately 3.7 miles to Princethorpe. At Princethorpe, turn right onto the B4455 Fosse Way for 5.1 miles passing through three crossroads to arrive at the exhibition centre. From M40 London/South: Leave M40 at Exit 12 turning left on the B4451 signed Gaydon/Kineton. After 0.5 miles turn right onto B4100 signed Lighthorne Heath. Follow B4100 for 3.8 miles and at the third roundabout turn right on to the B4455 signed Leicester (Fosse Way). Follow B4455 for 3.8 miles to arrive at the exhibition centre. From M40 North/M42/M5: Leave M40 at Exit 14 signed Leamington following A452 approximately 0.75 miles to roundabout then take A452 (B4100) signed Stow/Gaydon (Note: not A452 LEAMINGTON). After 3.4 miles turn left at the roundabout onto the B4455 signed Leicester (Fosse Way). Follow B4455 for 3.8 miles to the next roundabout. Turn right onto the A425 and the main car park is on the left after approximately 200 yards. Leamington Spa Station is the nearest railway station that serves the venue with direct links from London and Birmingham stations. From there it is a 5 minute taxi ride or a little longer on the bus. London is just 1 hour away. Direct rail services are available from Birmingham, Coventry, North East, North West, South East and South West. Birmingham International, the largest airport in the midlands, is only 30 minutes away with direct rail links to Birmingham, Coventry and Leamington Spa. Also the newly developed Coventry Airport is 6 miles drive. 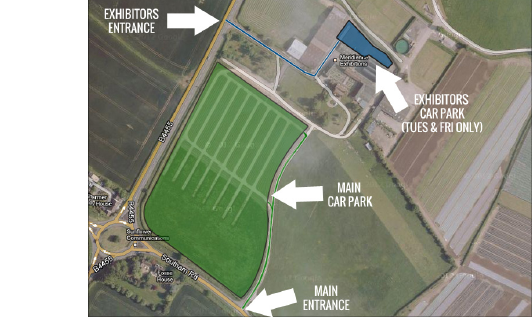 During periods of Setup and Breakdown, Exhibitors are invited to use the Car Park located directly behind the Exhibition Hall for ease of access and for a shorter distance to transfer exhibition goods. However please bear in mind that there is limited parking in this area, so if you have no goods to transfer, then please use the Main Car Park. On the days of the Exhibition, please use the Main Car Park, unless you are once again transferring exhibition goods. Below is a list of amenities local to Geotechnica's site - the Warwickshire Event Centre. We provide these in the hope that they make your visit to Geotechnica simple, stress-free and most of all enjoyable.